How Long Does It Take to Grind a Stump? When deciding to remove tree stumps from your property, it pays to be well informed before you decide on a contractor and when to get it done. 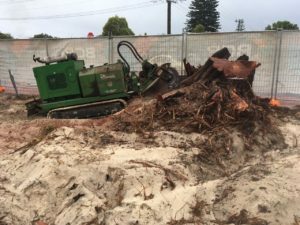 The length of time it will take to remove the stump is significant as you need to know if you will be inconvenienced at all and how long it will take to have a clear space for your new garden or earthwork plans. Armac carry all the necessary equipment and experience to remove stumps efficiently and safely, with a minimum of fuss and for an affordable price. 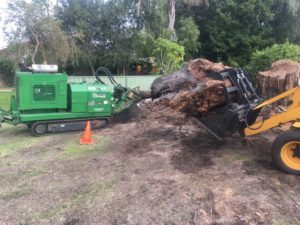 Widely experienced in all areas of tree removal, stump grinding, earth works and yard cleanup, Armac can assist with all enquiries to keep you informed as to how long it will take to grind out your tree stumps. If a stump is of a significant size, it will take longer the grind out. Stump grinding blades come in only one size and when the stump is removed, it produces a significant amount of mulch, which can be spread around your garden or taken away from the site for a small additional cost. Large stumps take longer because the workload is increased in duration. Even if your tree stump is small, it may be hard to access. Stumps that are embedded behind retaining walls, near other established garden or close to fence lines are tricky to get to so will take a little longer to grind out. It may also take longer in labour time to manoeuvre around the obstacles and safety equipment to be set up to remove the stump. A brand new stump from a tree that has been freshly removed will undoubtedly still be moist and hard, whereas an aged stump may have been weathered and be slightly softer. If the stump is hard yakka to grind, this will inevitably take longer to remove, whereas if the wood is dry and easily broken up, the job should be much quicker. Looking to have tree stumps removed at your place? Look no further than Armac! Friendly, professional service at affordable prices and safe, efficient workmanship to get the job done right and fast. Call Ray today on 0448 442 477 for a free, onsite quote.